Due to the popularity of this recipe I have decided to give it it's own page. As you can see, various people from all over the world have been sending me suggestions on how to improve this recipe. Please email me your comment/suggestion and I will gladly add it to this page, if you happen to have your own website, send the URL along as well and I will add the link with your name.. So, c'mon, be a sport, lets see how many suggestions we can get! There is a tremendous increase in the technological efficiency of electronics. Now a range of advanced features are available in a cell phone like a high quality camera, voice recorders, internet through which you can download free ringtones and much more. Now people actually have the whole cinema in their house by installing home theater systems along with a projector. Everything is going wireless with the advances in technology where science has amazing products to offer like a wireless camera and a wireless router. Don't get me wrong, I love animals and this recipe was given to me as a laugh, so have a smile with me. This dish takes about 2 to 3 months to prepare. Note: Under no circumstances do we kill elephants for food in South Africa. All elephants exist protected in their natural habitat in our game parks. When the parks become overpopulated (elephants are very destructive to the flora) they are either re-located or undergo planned culling. Hunt the elephant, warthog and guineafowl. Hang guineafowl to ripen. Cut elephant into edible chunks, (will take about a month). Boil the warthog with other ingredients (except guineafowl) till nice and juicy. Now boil elephant chunks over high flames till tender. (will take about 4 weeks) and add everything together. Boil for another 5 to 7 days. Note: If the above isn't enough, add the guineafowl as well. Love your elephant stew recipe - although it could, perhaps, be improved. We always find that, when word gets out that 'Bwana' is skinning another elephant, we can never be sure just how many people will turn up. Therefore, we always keep a rabbit in the freezer - this can be added to the elephant stew at the last minute, when you realise that one elephant is not going to be enough. Also, we have found that 5ml of paprika and a pinch of nutmeg makes all the difference to the flavour of the elephant. Just thought I'd write to emphasise that as previously mentioned by the Holt's; rabbit may be added but as stated in my mum's recipe "Only use rabbit, NEVER use hare, as many people are put off by finding a hare in their food." When I was with the Indian Army, my cook - a splendid little chappie - always added a couple of pounds of dry mango powder - Amchoor is what the locals called it - to our elephant stew, which we always had as an appetiser before Christmas Dinner, as it is an excellent tenderiser. It cut the cooking time by about a week depending on whether it was a cow or bull elephant. For additional flavoring add some origanum and fakawe bird portions. For those of you who don't know, the fakawe bird is a flightless bird with short legs living on the grass plains of Central Africa. To see where it is, every now and then it jumps up to see above the tall grass and shouts: "where the fakawe!" 2. Add enough brown gravy to cover your elephant an cook for about four weeks at 250 degrees C.
3. This serves 3000 people. If more are expected, add two rabbits, but do this if only necessary as people do not like to find hares in their stew. Please Note: A word of Warning though - Elephants are protected game, so do please be careful that you don't get caught catching your elephant. berries - a couple of tons should do the trick. dish. Oh, and do mind those back legs - they are somewhat sharp! Your elephant stew sounds really good but you could always add a little Texas style. Just to give it a little kick or two. Follow all previous ingredients and add to it. Believe you me it will kick. Elephant Stew - surely any game recipe wouldn't be complete without a good drop of red wine - may I suggest 10 dozen bottles of good Shiraz - to be split 50/50 as follows: 5 dozen bottles for the stew, 5 doz for the chef - to be drunk in liberal doses while preparing the stew ! Warning : definitely no dooswyn !! You should also add a warning that if any individual plans to eat all their elephant stew at one sitting on their own that this could be dangerous to their health. People who have tried this in the past have been know to burst ! I love it. But I think that you must also add this very important utensil: the monkey tail. make sure you avoid gorrilas and vervets because they their tails take more time to harden. When hunting for the monkeys make sure you carry a lot of bananas, not to feed them but to peel, so that the floor becomes slippery and to delay other monkeys while you run for you life. Cut the tail at exactly 12h00 midnight and release whatever remains. Add the gogoba plant to sterilize the tail. We have just sampled your elephant stew, and would like to suggest the use of kiwifruit as a tenderiser. In addition to this we found that the addition of 2 - 3 pukeko ( Native N.Z. swamp hen ) added a definite appeal. 3/50lbs Bag of Vadilla White Onions from the back yard. now add the bourbon and don't drink any either. slow cook till meat is nice and tender then add apples and peacans. Have fun now ya here! Now where the heck do you find elephants in Kentucky????? What's a stew without the biscuits?.....Several dozen......maybe Red Lobster style (with garlic and parmesan cheese)? From Lucie: one of the many that went cruising and ended up on an island in the Caribbean. Had the stew often when we lived near the source of elephants, now we substitute an equal quantity of goat, mongoose, brown pelican and land crabs, tons of them! (a kind of surf and turf). All easily found on the islands in the Caribbean. How do we cook up a stew of elephantine proportions, you ask? Well, we find an aluminium dinghy and make a fire on the beach, does the job just fine! This stew is delicious but we always have a side with our stew, usually a veg. and some salad. Now with such a filling stew it is not necessary to have too much, a half a grape tomato and a kernel or two of freshly boiled and buttered mielie should suffice. Just enough to round off the dish. We called these rendered fat drippings 'kai-ings' when we were young. Crumbled and sprinkled over elephant stew it added the finale exotic touch. Elephant stew is good but the best ingredients to add are cashews and ackees these two things will add a zap of colour to your stew. It can can be used for the vegetarians instead of the guineafowl. Also how about using elephant turds instead of charcoal for heating up the stew. I have heard that they burn up a storm and the aroma really gives the dish authenticity. Where I come from, seafood is a very important element of our cuisine, as it is in South Africa. What would a proper Elephant Stew be then, without the addition of freshly steamed Maryland Blue Crabs? Of course, the crabs must be seasoned with Maryland's own Old Bay Seasoning, steamed until red and then picked clean while guzzling beer by the keg (which may or may not add a little extra spice to the stew!) and consuming mass quantities of corn on the cob and potato salad! And unless you're really daring (or drunk from all that beer), don't forget to throw away the crab shells, especially the claws. They're quite sharp! Now I'm hungry, so I think I'll start on my next batch of Elephant Crab Soup. Anyone want to come for dinner? What I find appetizing, is to add 4-5 African Jackass Penguins,(don't forget to remove beak and feet. Sautee the penguin, in a vat of butter, add 4kg cumin, 1 1/2kg ground red pepper, and a dash of garlic. Also while boiling, add carrots, celery, corn, lima beans, okra, and peas. (that way the vegetarians can pick out the meat and eat the veggies). Throw in a few frog legs for extra flavor and crunch!!!! Marinade the elephant chunks for 6 months in 20 000 liters of treacle and all the red wines you can get your hands (and American Express card) on at the Nederberg Auctions. Sauté in 10 000 bottles of KWV Port (are we still allowed to call it Port?) for 2-3 days, allowing a generous chef's tasting of Port, purely for quality control every 100 bottles, you understand? Add 4 000 bottles of a smoky shiraz and bring to the boil within six weeks. Towards the end add 650 bottles of brandy and flambé, wearing an asbestos apron and welders mask, and having the local fire brigade on short notice. I stumbled on your site whilst searching for a traditional South African recipe to make and take to a New Zealand BBQ. I found the Elephant Stew saga hilarious and laughed myself silly. From downunder we would definitely have to add a sheep or two and definitely a few hundred mince and cheese pies!!!!! We could also throw in a few "Black Caps", "All Blacks", "Black Sox", "Tall Blacks" etc etc to give it that tender human touch. We could even (perhaps) arrange a Haka to be performed before we ate the stew. Enjoy reading your Elephant Stew, how about adding a few Penguins. Also we must not forget some red hot pepper four pounds, parsley 15 cups. garlic 100 cloves, and that good oregano. Must add some spice to this wonderful recipe. In deference to Amanda Prinsloo and ladies from West Yorkshire, hello girls, dried elephant turd's certainly do add authenticity to the aroma and the flavouring of elephant stew. We in the Cape used to add 12 barrels of good brandy in the last week or so, it really tenderises the elephant and adds body to the gravy. We eat this stew with a good helping of pap and soetboonjies, salad and grated biltong to sprinkle on top of the stew, like the cheese on spaghetti. Ta ta hey, and enjoy. You know, it suprises me. Everybody is making suggestions on presentation and so forth, but everybody seems to forget that you need an entree. about dessert? Realizing that you might be a little full after the MASSIVE amounts of Elephant Stew.... maybe a Scoop of Ice Cream with Chocolate Syrup? substituted if so desired -- butterscotch, etc). The butcher was very helpful, he was able to supply the elephant ready skinned, boned, and quartered as he usually keeps a couple in his freezer for the more discerning tastes. And he gave me the skin which the local carpet fitter has laid in my lounge ... now I sit on the dear creature whenever I want. The guinea fowl too not a problem. But the warthogs he only had 9 of so my mate went down to our local zoo and poached one. I had to go to a farmer for the rest of the ingredients but he suggested I leave out the wheelbarrow. He said "a bit of iron in your diet is ok but the wheels will make it a little bit rubbery". I cant get the chutney because in our country it's a protected species. But it was suggested I use the mopane worms like on your other page. Now all I have to do is find a pot big enough! I was going to make some elephant stew following your recipe but while I was cutting it into little chunks my uncle stoped by and said I should have dressed it first (which you failed to mention) I had been cutting it up for 5 weeks and it was impossible to tell what size it wore so I had to throw it out... I'm going on another elephant hunt but have checked with K-mart Wal-mart Target and even big and tall shops, the biggest I could find was XXXXXL. where do you go to have yours dressed. In the mean time I think i'll just roast a giraffe neck if I can find a pan long enough, I have a great vegetarian recipe for people that don't eat meat using fried rhino tracks.. Gary from Ioway..
A person from Ioway (Ioway=Iowa I'm guessing!) suggested that the elephant should be dressed but he couldn't find a store that sold a large enough size. Well I know a place: Farm and Fleets in Wisconsin (where I lived for the first 27 yrs of my life, Wis. not F and F!) have some Enormous overalls!! I have a suggestion of my own though for the stew... take out a hundredth of the stew before adding the elephant or any other meat and cook in a separate pot for all the vegetarians please!! Thank-you! Yes, I am a vegetarian and also a collector of elephants. Not the live ones though, as my backyard is not big enough and there are too many lovers of elephant stew too I've found for that to be safe anyway!! A person from Ioway (Ioway=Iowa I'm guessing!) suggested that the elephant should be dressed but he couldn't find a store that sold a large enough size. Well I know a place: Farm and Fleets in Wisconsin (where I lived for the first 27 yrs of my life,Wis. not F and F!) have some Enormous overalls!! I have a suggestion of my own though for the stew... take out a hundreth of the stew before adding the elephant or any other meat and cook in a seperate pot for all the vegetarains please!! Thank-you! Yes, I am a vegetarian and also a collector of elephants. Not the live ones though, as my backyard is not big enough and there are too many lovers of elephant stew too I've found for that to be safe anyway!! First catch your elephant - but how? Here in the wilds of Gloucestershire we trap peasants whoops pheasants with raisins dipped in brandy and they willingly stagger into the stew pot. What is the elephant's tipple? Ek gooi weer 'n paar tjops oor my skouer weg, dit hou die olifante weg. Hi! My name is Leeza, I'm from the USA, and I have a suggestion for elephant stew....My classmates and I LOVE chocolate so I just thought that it would add a dessert kind of kick to this recipe. But remember...You have to find a store to sell chocolate elephants. I'll go ahead and pick up two and use the other one for an Easter Elephant. HeeHeeHee!! By the way, I was doing a project where we had to pick a country from Asia or Africa and I picked South Africa. Your website really helped. THANKS!! I'm sure everyone will love the Elephant Stew recipe!! Jun 4, 2003...and from Sharon Dickens - When-We twice removed ! First get the elephant to trample the ton of potatoes/veges, thus saving time peeling and chopping. Next collect all elephant dung for the fire, as it burns for longer, and reduces the need for large amounts of firewood, thus helping with the forestation programme in your area. Another added plus is that it will keep the mozzies away ! Actually one could always use any left over dung to build a modest hut while waiting for the stew to cook. Then cut into sizable steaks, tenderize with steam roller, and use combine harvester to chop up. Do not add the amarula berries, save these for the mampoer that is already brewing, from left over potatoes and maize meal !!! Hi there Pete - Just had to send this one to you!! Taken from "What's Cookin' at McClung?" Sponsored by : Yearbook Committee. I find as with most meat a bit of lemon to soften things up. So for an ele, perhaps a plantation or two of that lowveld citrus for about a week or three. Should do the trick, if not just make sure the Castle is cold and the biltong is not too dry. I think people are forgetting that Brooklynites love delicacies too. When I lived in Brooklyn, NY, we would prepare it occasionally on Friday evenings in place of chicken. We would use about 10 cases of matzoh meal (kosher-style bread crumbs) in the recipe. We like our food crispy. We would dig up someone's back yard, put down palm fronds sent to us from Africa, season the elephant with salt, pepper, paprika, matzoh meal, and plenty of garlic. Also, Fleishmann's Margarine (it's heart-smart) to ensure a healthy meal. And of course, the grand finale, 25 cases of Mogen David Wine to simmer at the very last. Of course, truckloads of Vidalia or Bermuda Onions, Idaho Potatoes, and carrots tossed in at the beginning add to the total flavor of the elephant. If you start cooking on Monday (and remember to cover the whole magilla with palm fronds as well), then by Friday night you end up with a feast beyond belief! After eating all that, it's best to have a light dessert. We use the bottom of the elephant's feet to make a scrumptious gelatin (jello) or gelato dessert. Add a fruit of your choice for flavoring. And don't forgot that dollop of whipped cream! Mangia! I don't see any mention of herbs or Tabasco Sauce to the Stew! Tomatoes to tenderize the meat.Maybe some Beef Broth? Math is not my speciality, but someone must know the size of the ingredients for this large amount of Elephant Stew! Wine sounds good or beer. better the second day reheated. About that Texas addition: habanera peppers are UNBELIEVABLY hot! Seems to me you should start by roasting the elephant in a pit. Seems to work well with pig. When it's tender, it will just flake apart. I'd add about three quarts of brewer's yeast. That makes a stew very tasty. Also, add a bushel full of crushed oregano. Also add a ton of mushrooms sauteed in butter, and the leftovers from your refrigerator. That's what stew is for: to get rid of the leftovers. Chop up and simmer the liver separately, in beer. Make that good dark Loewenbrau from Germany. Yum! Reminds me of the recipe for alligator gar (a fish). Fasten the gar to a pine board. Mix up your favorite sauce of the most costly ingredients. Put the board and gar on a spit above a roaring fire, and cook for 24 hours, turning and basting constantly. Throw away the gar and eat the board. Oh and by the way, John Warwick Montgomery says that there is a green elephant in his back yard eating a strawberry ice cream cone. You need to go take a look for yourself, eh wot? Enjoyed your stew on our last visit to Kenya, however may I suggest that one remembers to remove the toenails before cooking, and also retain the tail hair to use as dental floss for that little added value. We also planned ahead and used the local tribesmen for the chopping and stiring. This cut down the preparation time by 2 months and then made this a viable recipe for those shorter holiday visits. We also planned ahead and used the local tribesmen for the chopping and stirring. This cut down the preparation time by 2 months and then made this a viable recipe for those shorter holiday visits. Well, as an Afrikaans girl from the Zeerust/Koster region, this was our 'saamtrek' feast over Christmas. My Grandma however insisted that EVERYTHING will taste better with apricot jam, and it DID! She also had the elephant tenderised by a few kicking ostrich, and then used the toughened ostrich as a stirring spoon. This added the extra rich flavour (PLEASE keep in mind the Ostrich has to be plucked) as the ostrich would cook and blend with the elephant flavour. Grandma also believed "Waste not want not" so when all is said and done, the ostrich can be dried and you can have elephant flavoured Ostrich biltong! You forgot the truck load of fresh garden snails. simmered over the fire. My best source suggests that after the elephant meat is cut up, it should be soaked in 55 gallons of buttermilk on the bottom shelf of your refrigerator for at least one day. Most importantly, this will aid in removing the gamy taste, but it will also allow the chef to catch a few winks after cuttin' up all of the meat. Unfortunately, I have never been able to prepare an elephant stew myself. On three occasions I have been arrested by the night guard at the Houston Zoo while stalking the elephant herd and carrying my elephant rifle. Perhaps the next time I'll be luckier. Where else do you think I could find an elephant in Houston, TEXAS? cotton-tail rabbit. They're about the same size as an elephant, ya know. However, I'd then have that problem of having hare in my stew. Back in colonial Africa, my dad (who was based in Nyasaland; now Malawi) did a lot of hunting. He was not particular to warthog as he had quite a horrible reaction to it. He broke out in terrible warts (what else!). He found that a fully-grown kudu bull was a healthier, tastier alternative. The skin makes a beautiful rug and, with those magnificent horns, it makes for an impressive trophy. To the original recipe add 6 bottles paprika as it brings out the flavour in the kudu meat, one bottle black pepper and 20 litres stock made from the bones from your previous stew. Thicken with 4 kg maizena. The bones must be boiled for about four months, by which time you are just about ready for your next stew. Also in Malawi our mushrooms can grow to a height of about 50 centimetres and are the size of dinner plates. About 103 of these cooked for one hour in 50 litres chakalaka sauce make a divine accompaniment to the meal. We usually add 5 bottles 'abale samalani' (translated 'please be careful') chilli sauce to the chakalaka, but this can be substituted with tabasco sauce. Not quite as lethal, but just as good. Just be careful when hunting the kudu. My dad told us the story of the first time they made this stew. (This part of the story is true) After killing the kudu, they went on back home and left the trackers and bearers to bring the meat home. By sunset the trackers and bearers had not arrived and worried that they may have been attacked by one of the big cats, my dad and his posse returned to the place they had left them. They found the bearers with all their limbs intact, sitting around a fire, finishing off the last of the kudu. Rather wrap the kudu in tarpaulin, chuck it onto the top of your Land Rover and take the meat home yourself. The Elephant Stew looks quite delectable. I would take out the potatoes and make up a ton of hot pasta noodles and ladle it over. Rice would work too. I have found that the elephant in february to be very tough. Instead I then use 14 eland or 129 Impala. After perusing the original recipe and all of the fine and innovative modifications offered by gourmets from around the world, I doubt that I could add anything significant to the discussion in terms of ingredients. However, I notice that the vast majority of the recipes involve lengthy cooking times, which could be a problem for a host throwing together a last-minute dinner party for a few hundred close friends. With that in mind I would like to suggest that the elephant stew, once prepared for the oven, be microwaved instead. This will be difficult utilizing the microwave over the stove in the average US apartment kitchen. However, it should be a snap if one simply places the elephant stew (in a non-metallic bowl) between two AN/FPS short range Doppler radar units propagating radio waves in the 1215-1410- MHz range. Note: as always in using two such microwave propagators in close proximity, the dishes should not face each other directly!!!! If there is simply not room in one's home for the Doppler radars, a quick visit to the Kennedy Space Center in Florida the next time a space shuttle is launching should do the trick. Simply place the prepared stew on the launch pad under the shuttle and watch how its 7,779,000 pounds of fiery lift-off thrust cook up that pachyderm in jig time! Plus, your casserole will be topped with a delectable crispy crust! Hope this works for you as it has for me. I get my elephants to the States by using UPS - United Pachyderm Service ! Filipinos love roast elephants! the crackling skin is a delicacy. 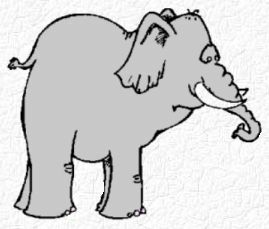 As far as your stew goes, I have been thinking about how best to explain the concept of an elephant to Aussies who don't know anything bigger than a 'roo (the red ones do stand as high as a ute, but). I think here in Queensland, the next best thing is liquified polar bear. Now being a conservation minded nation that baulks at the idea of eating their national symbols ('roo and emu which taste a lot like springbok and ostrich) the Down Under fellows have got very cunning and refer to the brew as Bundaberg Rum. Its jolly good but you do feel a bit guilty with the bloody polar bear winking at you from the side of the bottle. May I suggest you try and get a bottle for testing while you wait for the ellie to cook. By the way, I have found cane toad fritters to be a great side dish and you dont get into too much trouble as thems are evil aliens over here. Having compiled a recipe book of my own, I have noticed one ingredient you have omitted that would just make your Elephant Stew - GARLIC, please don't forget the garlic. 2 bags should do it but If you don't have garlic, a couple of dozen skunks work just the same !!!!! Keep up the good work. Locate the frozen mammoth (the sled dogs were really useful for this, but had to be kept away from the carcasses as we were unearthing them as they were very attracted to the smell of the meat). After the mammoth was exposed, we excavated into the body cavity with dynamite and removed the organs (the dogs loved them, but we kept the liver for Kasimir Toadfoos, our fishing expert, who really gets off on bathing with them). After obtaining all the remaining ingredients from Mukhluk’s Trading Post and Thai Restaurant (we couldn't find the Woolly Rhinoceros, so we didn't try to substitute), we skinned and deboned the snow hare, stuffed them with the herbs, the pod flakes, the stewing tomatoes, the garlic salt and Mrs. Dash and wrapped them with two-foot sections of the pancetta sheets. Meanwhile, Arty MacMillan and Ethan Frazier, our geologists, took turns with the flame thrower, thawing out the mammoth carcass, careful not to burn the outer surface. Next, we skinned and deboned the caribou, removing the antlers and hooves (Mukhluk was quite happy to buy all the skins, antlers and hooves back from us, as well as the tusks so that part of the cost of the meal was thereby offset). The bones were placed in the goshawk broth and simmered over a low flame, watched by Glyra Mendez, the only woman among us (she was our skiing expert – pity about what happened to her later… but that's another recipe). The caribou were then stuffed with the pancetta-wrapped snow hare and marinated in the white wine for four (4) hours. In a large iron skillet (extremely large – it took both of Mukhluk’s cousins on his mother's side to lift it) we sautéed the garlic, shallots, mushrooms and the bay leaf in the EVO. It is always important to remove the bay leaf after the sautéeing is finished as many a Woolly Mammoth dinner has been ruined by queasy diners who failed to do so. Meanwhile, the now fully-thawed Mammoth carcass was filled with the potatoes, the seal hearts and the blubber. The marinated Caribou were also added with the pinch of thyme. The carcass was then carefully sewed up with 200 lb. test nylon fishing line while the sherry was added to the skillet and allowed to partially burn off. The eggs were also well-beaten and the salt added to them at this time. The Mammoth was then dipped in the salted egg mixture and then into the matzo meal until it was fully coated. It was then transferred immediately into the skillet. Any remaining egg mixture and matzo meal were then made into 3-inch patties for frying as an accompaniment to the Mammoth meat, along with string beans sautéed in butter. Ivan Torneau, our pilot, was then responsible for basting the Mammoth at ten-minute intervals with the goshawk broth (after he first strained the bones out with a fisherman's net). I alternated with him every two hours. After twelve hours, the smells were impossible to ignore – we were all famished, having eaten nothing but shredded wheat since the previous Tuesday and Mukhluk’s cousins were getting impatient (Mukhluk’s last shipment of provisions never made it past a storm between us and Juneau and was a week overdue). Ivan and I then took our timber saw and cut that sucker up into 4-inch thick sections (that's when we found out where Ethan had gone and disappeared to) and we ate the steaming meat under the Aurora Borealis that night. Yum. I recommend Woolly Mammoth to anyone with a taste for good eating. Actually I have a question? How much rice must I cook to accompany the stew? Three kilograms don't seem enough! Seeing as though we're all into rececling, I have a great suggestion for the leftover bones of the elephant - FURNITURE! We could get cushions made up in a nice ethnic pattern! Maybe ethnic carvings on the sides!! Could start a whole new fashion trend! please do not forget to add one apple to your recipe. After cutting elephant into chunks place them in a cement mixer (the ones you get on the back of a truck) Rub the mixer on the inside with garlic (make sure all cement has been washed out) Add spices and marinade and ask the driver of the truck to drive around for a week to ensure that all the chunks are nicely covered with the marinade. Remember to sharpen the ones you are using for the sosaties at both ends. In the Western Cape we call it Bloekom Skewers. The skewers must be soaked in water for a month to allow them not to burn while grilling the sosaties. You can use your swimmingpool, just remember to drain the pool because you have to make the fire in the pool with the rest of the trees you have cut down. in any sweet wine) inbetween each chunk of meat on skewers. If the skewer wont go through the apricot, discard apricot. Grill sosaties over coals in swimmingpool turning the sosaties regularly. If you cannot find enough friends to help you - line up another two elephants to do the turning - they can be used in your next stew. Oh yes I forgot about the vegetables - discard all other ingredients not used. Wow, what a recipe! It wasn't too easy to prepare...I'd never tried it before I'd read about it on this website. I found that it was a mammoth task to make the elephant meat the right texture...I just couldn't get it tender enough. I even added the red-wine whilst taking great care to drink liberal amounts of it myself; I also added a about 45kg of basil to it when I discovered that I wasn't going to get it perfect, but I kept the rest of the recipe as it was. Then there was the problem of how to get it all eaten up...so I notified a local charity group, about a month before the time, of what I was about to do and they organised a few thousand underpriveledged people to help me out. I don't think they cared too much that the elephant wasn't tender enough. So, speaking from experience: don't try this recipe unless you are absolutely sure that you know what you are doing! Here in Jeddah it's a bit difficult to find warthog - so we use 5 to 6 camels instead. Include the hoofs (hooves?) as, on the rare occassion that there are left-overs, it makes a really good brawn when placed in the fridge. Wheelbarrow onions are also very seasonal, so we sometimes use dates - this gives the stew a very rich colour and delicately sweetened flavour. For a traditional African flavour, try adding about 1000 litres peach mampoer. The elephant will really appreciate it, and it does wonders for the gamey taste. DO NOT DISTURB, You do not want to come between an elephant and his mampoer!!!!. Stew the elephant with the other ingredients in the original recipe until a toothpick goes right through (my mother’s method for testing if elephant is done). Serve with some stampmielies on a bed of maroggo. This dish is best enjoyed if you eat it the traditional way: no fancy schamcy European silverware. Hope you will enjoy this dish as we have ever since we first caught our first elephant, but that’s a story for some other time. We have found that skinning the elephant was a major mission and too time consuming. However, wrapping the elephant in clay, and baking it in a hole in the ground worked exceptionally well. Place enough boulders in the bottom of the hole to cover the base of the hole. We found that the judicious placement of a jet-powered dragster heated the rocks in record time. Note: wear ear protectors. While the rocks are being heated, cover the elephant in a generous amount of damp clay. We used approximately 12 tons of clay and a team of 40 assistants to coat the elephant before the clay dried. Carefully place the elephant in the hole - you can use the JCB for this. Cover with the remaining boulders and place a piece of metal (large enough to cover the hole) on top. Send the 40 assistants out into the bush to gather enough material to make a large fire and build said fire on the metal plate. Send the 40 assistants off on a mission to purchase, or otherwise acquire, a suitable quantity of Amarula Cream. Send the 40 assistants off on a mission to acquire a compressor and a jack-hammer. Ask the 40 assistants to rustle up some traditional African vegetables and prepare any way you like - you'll be beyond caring at this time due to the amount of Amarula Cream consumed. Once judged to be ready, and with the use of the JCB and the 40 assistants, remove the metal plate, the rocks and the elephant. Using the jack-hammer, remove the clay coating and discard. Give the 40 assistants the task of carving the baked elephant into reasonable portions, keeping them warm by tossing them back onto the hot rocks in the hole. Get on the cell-phone or radio and invite all your friends to dinner. Dismiss the 40 assistants and enjoy a splendid meal with all your friends. Don't forget to chuck in a rabbit in case you get more visitors than you catered for! PLEASE! When finished, make sure you return all the cooking aids you 'borrowed', such as the JCB, the dragster and the jack-hammer. Also, please respect the environment and fill in the hole you made. Use the JCB for this BEFORE you return it. I myself prefer smoking the elephant. It takes approximately two years until it's done, but is well worth the effort. The smoking (over apple wood from an entire orchard) eleminates quite a bit of the gamey elephant taste expecially when you're using an older elephant. I’ve gone through the entire listing of Elephant Stew suggestions that add more ingredients and cooking methods but failed to address the most basic Three P’s of a good stew – preparation, Preparation, PREPARATION. Upon selecting the beast, it is crucial to put it in the right mood for slaughter. Being in the right mood will keep it tender, tasty, and juicy. This is accomplished by having the beast consume 16 gallons of good Irish whisky to tenderized its head, neck, and shoulder portion and 20 gallons of Hawaiian Okolehao to tenderize the rump portion – ten gallons per direction of sway. Cut two fully-matured hardwood trees per ton of elephant to fuel the cooking process. After slaughter, care should be taken in the skinning process for use of cured skin to provide shelter for the ensuing party. Another suggestion is to substitute the elephant with half a whale (must be fresh), substitute the 10 wardhogs with 10 sharks (must be fresh) and the 4 guineafowl with large octopus. This makes a wonderful variation to create a surf and turf. However the preparation time and method may be the same always add a pitch on sea salt. I thoroughly enjoyed this as it really brought back fond memories from when I believe this "process" originated in the pre-web days of bulletin boards and news lists. There was no instant access with 600baud being quite acceptable for connecting to your host to download your daily fix of mail from the various newsgroups. In fact we ran BBS's on 1200 and 2400 bps dialups for years. If I recall correctly, this feed originated in the NZ-ZA feed which was piped via the UK as we did not have direct connections with New Zealand from South Africa (for our mail that is). The original feed around 1986 or 1987 involved inviting everyone on the feed to a braai (barbeque) and over a period of about a year and with much interjection from the UK crowd the whole recipe developed. AFAIK some brave people even went overseas and met up with each other for celebrations, but what was eaten remained shrouded in mystery. The thread just would not die and the additions by late comers invariably led to much discussion. Being a braai of "African" flavour, the elphant was cooked in various ways (not just stewed) and of course there had to be giraffe sosaties, ostrich egg omlettes, hippo tongue etc. The list of ingredients was endless and the cooking methods most unique and ingenious. I prepared this dish for all the South Africans living in Lima, Peru. To add a local flavour, I served roasted guinea pig on the side. As much as I love to try out new recipes, your elephant stew recipe has me worried. It doesn't state whether or not to use wild, or domestic elephants! We have three pet elephants that we dearly love. After reading your recipe, to be quite frank, we're scared to let them out of the house now! You've forced us to start using a litter box out of fear we'll never see them again! meal and the rest for the cook. Make some herb dumplings on top and voila, a meal in next to 2months!! Elephant stew is not the same without having added one rabbit (skinned & deboned). The rabbit greatly improves the flavour, just as a little bit of salt does. Obviously your recipe was recorded by someone who strongly objects to finding a hare in their food. suggest marinating the elephant in it first. This should completely disintegrate any tough sinewy parts of the beast and add quite a kick to the stew. Very fine recipe I am sure many folk around the world enjoy this tremendously, however here in Dubai, it has been suggested that you might add a few Camels. I'm not to sure whether is should be filters or plain, but what the hell we will give is a bash. May I suggest a true South African way to make sure that the everybody enjoys the meal. Start with 100 bottles of KWV Brandy, 75 bottles of Good Peach Mampoer and about 1 truck load of Castle Lager. Make a fire with a truck load of Charka Briquettes and follow the original recipe. While waiting for the stew to cook, open a couple of Castles to get everybody in a good mood. When the meat is almost done start drinking the Mampoer. Make sure that all the Mampoer is finished by the time the stew is ready. Taste the stew and if by any chance it tastes like crap, open the KWV and start dishing out the stew. By this time nobody will care what the stew tastes like. I simply must object to the person who suggested adding mincemeat to the elephant stew. Minces are endangered species. My brother and I have been hunting for one for years and can't find a durned one even for Christmas dinner, let alone dumping it in an elephant stew. We do have a suggestion though. Throw in a naugha. They keep making all this stuff out of naughahyde, and just throw out the perfectly good naughas once they get the hyde off. Naughas would certainly be a lot better than a hare in your stew. Here in England at Christmas we always serve Elephant Stew with a Brussel Sprout speciality. Place sprouts plus an equal amount of balsa wood in a large pan. Cover with water and boil for 5 hours. Discard sprouts and eat balsa wood. - 30kg of roughly chopped aubergine (Americans call this eggplant). - 20kg of dates (preferably pitted- you don't want people to start chocking to death, its very uncouth). - One goat (preferably a young one otherwise the guest will be left chewing for ages and they will never go home). - 1kg of Middle eastern herbs and spices: zatar, chili powder, cardamon seeds, flat leaf parsley. Put whole stuffed goat in roasting tin and cook in its own juices for about 5 hours. Add carrot and potatoes and herbs. Now add the large chunks of Aubergine and dates, coat with goat juices. Cook together for a further 3 hours, then remove and add to elephant stew. Voila. Eat enjoy and be merry. mmmmmmmmmm. It sounds tasty, however I usually add a Hippo and 50kg of crushed garlic. I can also recommend adding Egyptian Geese in place of the Guinea fowl..........it makes a tasty variation. Well all this reading about the delicious stew has made me hungry and I am going to fetch my katty and a few marbles and go hunt my Elephant. Dinner will be served on 10 June 2007 at around 19:00. Lovely recipe, just remember to add the extremely ripe guineafowl on the 6th day of the final boil. I would like to add 20 pounds of alligator and 5 rabbits to the stew with plenty of salt and pepper and vegetables with a heavy beef broth added like a gravy and a side of elephant. Thank you for the recipe for elephant stew ,I must admit it was perfect as it was . Had a bit of difficulty geting an elephant here in Wales but fortunatly the local zoo in Colwyn Bay had one . The only thing I did find was that a bit of mint sauce on the side did enhance the flavour . Sir my viewpoint on this if your tired of Buffalo add one Water Buffalo and 3 Wild Boar hog `s from Selby farm. Toss in few Snow shoe Rabbit `s approx. 20 . Add 16 Squirell`s. 200 Lb Potato `s . Add 9 Bag `s of Marshmallows 60 Galena Pepper `s. One Gator from Florida. Use Splenda and No Salt. Celery diced. One huge Rattlesnake. Couple Bamboo Viper `s. 50 cases of C-Ration any brand. Sir is your constipated you wont be ever again. Also add 1 kangaroo and I will send you my Gay Bull ... Free.... 20 Bottles of Jim Beam. 40 cases Beer I like Miller `s MGD. Cliff Nelson has Elk to Donate I think you stir it every 30 minute `s. I forgot 1 Palm Tree. I want this for our Reunion every room has indoor toilet. I want to satisfy all member `s. Delivery date contact me I prefer Sept 21. 07 I thank you for letting me sign your recipe book. NO Anchovies Please. Cook at 350 Degree for about 8 hour `s.
Charles E. Martin, President -Historian, 18th Artillery Assoc. GP. Someone asked how to catch yourself an elephant. Well I heard that the best way is to dig a large hole, then gather and burn a bunch of brush. Next fill the hole with the ashes and open a can of green peas and place them all around the hole. Now wait till an elephant comes out to take a pea, then kick him in the ash hole. Works every time. For a Low Carbohydrate variation, you could leave out the potatoes. P.S. Don't forget the toothpicks! The local hardware store will help you set up the 30,000 L corrugated iron and cement dam on the back lawn in which to cook this lot in one go, but consider the electricity cost here. Alternatively, invite all the guests a little sooner, each with their own nr.4 potjie and gas burners, better to keep the environment smoke free. Remember, that the dam can always double as water storage and you can swim in it as well. We found that inviting only half the of the guests would be advisable, as the leftovers can be reheated and added to at a later date, which is a great idea for the Big days up ahead, especially as the 2nd, 3rd, and 4th times around, this particular stew gets only better and kinda morphed with a little Wild Hog and Mexican Vulture added later. I suggest that freezing the leftovers is easier in Canada than down south, but hey, be a sport and do it anyway. As taste is a personal thing, a Q-list for possible ingredients could be included in the invites sent to the 3,500 guests, all in the spirit of our somewhat wavering, fledgling democracy here in the RSA. P.s. Pete, Personally, I’d add lots of Amarula liqueur for flavour and softening, it goes like fish and chips. Hi there, we live in Barberton, South Africa and have tried elephant meat balls made by ourselves. All the wives were not very impressed with us and did not want the elephant meal to be made at their houses. So as daring as I am, we cooked it at my mother-in laws house. The women all had chicken. A week later, a rhino was on the menu - which was also at my mother-in laws house - but I missed out on that. Please don't get me wrong, we love animals and are constant visitors to the Kruger National Park, but this elephant came from a butcher. I've never been much of an elephant man, but being from the southern United States, I've come by varied elephant cuisine here and there. An elephant delicacy of our region is almost exclusively reserved for carnivals, fairs and circus shows, where the masses justify the meal, as an elephant can go a long way we know. In the south we like fried foods and sweet deserts, so we combine the two when cooking elephant ears. These are battered in doughnut breading and fried. Before eating, the elephant ears are sprinkled with powdered sugar and perhaps cinnamon butter. If you're ever fortunate enough to chew on an elephant ear, beware that unscrupulous hucksters vending this fare often cheat the buyer by pawning off simply the fried dough as genuine elephant ear. I had often wondered what use was made of the remaining elephants which provided all these ears. After extensive research, I first learned about elephant noodle stew. Consisting of capital letters, the alphabet pasta used in this soup is sometimes called elefantoni. It's believed that the recipe that is most used in our region has it's origins in Tuskany; owing to the strong Italian flavor. However some traditionalists claim that the Italian influence was added only after Hannibal (a general who commanded the Carthaginian army in the second Punic War; crossed the Alps and defeated the Romans with his army of more than 100,000, supported by elephants and presumably, elephant stew) strewed the dish all over the Alps and Italy to boot. I'll leave it for you to decide if this recipe trumps the ones you've published here. I don't remember all of the ingredients, but I know that choosing a ripe elephant is paramount. The elephant should be firm to the touch so as to avoid any squishy or sickly ones. When thumping (best done at the trunk) avoid hollow sounds or elephants who thump back. A white elephant usually works best even if they are more expensive. The elephant meat should be diced so rolling in a pot is easier. A python is also added. Use caution when seasoning with oregano. If snake eyes come up, scrap the stew, and make elephant chilli. A large refrigerated truck is useful in making the elephant chilli. After the preparations above, combine with a rue, okra, Cajun seasonings,... No wait! This isn't the recipe for elephant stew; it's the recipe for elephant dumbo! In any case, elephant stew is essentially the panacea cure-all for something you'll never forget, but it escapes me at this moment. The first time I tried it, it was just okay. My wife and I talked about it and decided to try it again with a slight menu adjustment. Now it's perfect!! The trick was to add a pinch of saffron when boiling the warthog. And, add 3 drops of Tabasco sauce just before the elephant got tender. I believe in "keeping it simple"! Slow cooked Ellie, on a Spit Braai, basted with apricot jam over a period of 1 week. With Eskom doing a "load shed" thing on us and my house not big enough to handle Ellie bones and meat, an open fire outside for cooking is just the solution. Finding the Elephant stew recipe this morning was great and gave me the "spit braai" idea. Sliced on a daily basis, the uses are endless!!! Important: Do Not Use Frozen Elephant Meat - Fresh Is Always Best!!! I see there are a lot of people from all over the world interested in this stew. I would like to take this opportunity, if I may, to inform them that we are the only Ironworks company that manufactures the No. 4083 “Potjie“ This is a 4083 litre pot and the only one in the world that you can use to make the Elephant stew in. If you want to add the fowls, we suggest you lift the lid with 2 bricks. The following interesting quote was sent to me by May Ellen Friend from West Virginia. This is a record of how a traveller and a gastronome, Le Vailant, tasted elephant in Africa: 'They cut off the four feet of the animal, and made in the earth a hole about 3 ft. square. This was filled with live charcoal, and, covering the hole with very dry wood, a large fire was kept up during parts of the night. When theythought that the hole was hot enough, it was emptied: a Hottentot then placed within it the four feet of the animal, covered them with hot ashes, and then with charcoal and small wood, and this fire was left burning until the morning...My servants presented me at breakfast with an elephant's foot. It had considerably swelled in the cooking; I could hardly recognize the shape, but it appeared so good, exhaled so inviting an odour, that I hastened to taste it. It was a dish for a king...And I devoured without bread my elephant's foot, while my Hottentots, seated around me regaled themselves with other parts, which they found equally delicious." 'That evening, for the first tme, I tasted elephant's heart, roasted on a forked stick over the ashes, which I thought then, and still consider, to be one of the greatest delicacies that an African hunter is likely to enjoy. The meat from the thick part of the trunk and from the cavity above the eye is also very well tasted, but needs much stewing to make it tender.'---F.C.S. Add 20 gallons of water to a clean 55-gallon empty oil drum (oil drums can be found in most Alaska backyards or frontyards - especially if the owner is a trucker). Should take about 3 months to get the amount needed,, so be sure you freeze what you get each day to keep it fresh. Stir every hour (or whenever you think about it) with a long birch pole. If more people arrive than expected, add three to four rabbits but remember that most people don't like hare in their stew. WARNING: Use care when bending over to dip stew out of bottom of the 55-gallon drum as there have been a few reported cases of people falling in. Had a good laugh at the comments and suggestions. However, as can be seen from the below Crocodile recipe, the best way to cook your elephants is in a heated pool - just don't forget to take the chlorinated water out - also, if you don't have one, make sure your neighbour that does, does not mind you utilising it - make sure they are also invited to the feast. However, I see that you do not have the fabulous recipe for Crocodile Curry-one that went down extremely well while living in the Free State (RSA). Extremely cold winters so the warmth of the curry was right on. As you will see from below - there are lots of extra's that will come out of the preparation - like gifts, jewellery and additional spin-off meals. 1. Beat crocs over the heads with a sledgehammer. 2. Collect tears in 44 gallon drums and use them for salad dressing. otherwise spare assistants might be required. used for handbags etc. Nice keepsake for the invited guests. During the 10th day the teeth will fall out and are used for jewellery and amulet's. 6. Surviving assistants then must cut crocs into bite size cubes. 7. Add remaining ingredients and allow to simmer for a further 2 days. apricot jam to give it extra juiciness and flavour - about 5 kgs or to taste should do. 8. Curry should be ready when the vultures start circling above.